If you want to look athletic, strong, and fit, there’s no substitute for great shoulders–for both men and women alike. That’s because the deltoids (those muscles that bulge out slightly on the shoulders of athletic folks) are visible from all angles of the body. They give your upper body shape and depth, and they can change your silhouette completely: by widening you a little up top, boulder shoulders can make you look thinner down below. If you want to increase your shoulder size, you want to focus on doing shoulder workouts for mass. Here are some tips on how to build bigger shoulders to help you get a pair of deltoids you’ll be proud to show off. In addition to being visually impressive, shoulders are also very functional. To bulk them up, it’s helpful to know how they work. Shoulders are your most mobile joint, capable of moving in virtually any direction. The deltoid muscle—the focus of the shoulder exercises below—is responsible for most of that movement. The deltoid has three sections: the anterior, or front deltoid, is primarily responsible for raising your arm up and in front of you. The lateral deltoid, does the same thing directly out to your side, and the posterior, or rear deltoid, moves your arm behind you primarily in the horizontal position, and lifts it to the side when you’re lying on your stomach. Inside the shoulder joint are four smaller muscles, collectively known as the rotator cuff, which stabilize your shoulders throughout it’s extensive range of motion. Though hard to see, these smaller muscles—which sport science-fictiony names like the infraspinatus and teres minor—are essential for shoulder health: just consider how many times you’ve heard the words “torn rotator cuff” and “out for the season” in the same sentence on ESPN. Typically the shoulder muscles, large and small, work together with the muscles around your scapulae, or shoulder blades—to create smooth, painless arm movement. How Do You Get Bigger Shoulders? If you want to broaden your shoulders, there are a few things you should keep in mind when you’re doing shoulder workouts. First, take care of your joints, and be mindful of anything that might be limiting your shoulder mobility, like muscle tightness . “When you have limitations in your range of motion, you place stress on your joints and assisting muscles,” says Openfit fitness specialist Cody Braun. “That usually leads to pain or injuries.” The solution, he says, is to stretch and foam roll the tissues that are holding you back before you work out. Likely culprits include the chest, upper back, and lats. Next, don’t shy away from longer workouts, especially if you want to build shoulder mass. The shoulder is complex, so it requires a lot of movements to build them up. Braun explains that hypertrophy (or muscle building) is characterized by volume and intensity. To shock your shoulders into growth, you might want to add a few more sets to your normal routine to really help you bulk up. 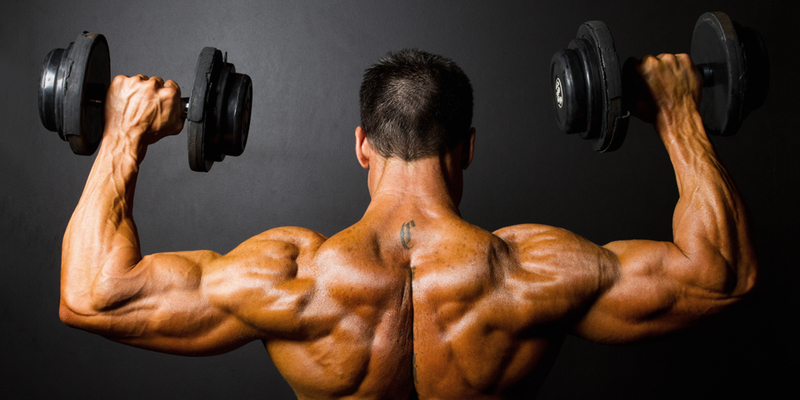 Are you ready to get bigger shoulders? Below are 12 of the best shoulder exercises to build mass. Mix a few of these moves into your workout schedule a few times a week (don’t do them all at once! ), and soon you’ll be showing off your bigger, boulder shoulders with pride. Benefits: This works the shoulders with accommodating resistance, meaning you work through an entire range of motion where the movement is easier at some points, and more difficult at other points. • Hold the handles of a resistance band and assume a shoulder-width stance, using both feet to stand on the center of the band to secure it. • Raise your hands to the side of your shoulders, palms facing forward. • Press the handles upward until your arms are straight. • Lower your hands back to your shoulders and repeat. • Too tough? Try the move in a lunge position with just one foot on the band. Benefits: This move prevents swaying or dipping the torso as you work the shoulders while using the heaviest possible weight. • Slowly press the dumbbells upward until your arms are straight. Benefits: In one move, you can work the front part of the deltoid in conjunction with the triceps, while placing minimal stress on the shoulder joint. • Stand tall with your feet shoulder-width apart, holding two heavy dumbbells at shoulder height, palms facing each other. • Keeping your elbows in, slowly press the dumbbells upward until your arms are straight. Benefits: The alternating pattern adds increases the time your muscles spend under tension—a proven factor in muscle growth. • Stand tall with your feet shoulder-width apart, then step one foot slightly forward in a staggered stance. Hold two medium to heavy dumbbells at shoulder height, palms facing forward. • Press the weight in your right hand fully overhead. • Lower the weight and repeat the movement on your left. Benefits: This move works the entire deltoid muscle through its maximal range of motion. • Stand tall with your feet hip-width apart, holding two medium-weight dumbbells. Arms should rest straight at your sides, palms facing forward. • Keeping your elbows close to your sides, curl the weights up until your elbows are at 90 degrees. This is your starting position. • In one smooth movement, curl the weights up towards your shoulders, then press them overhead, turning your hands so your palms face forward as you reach the top of the movement. • Reverse the move, lowering the weights under control as you turn your palms back to facing your body, and finishing in the half-curl, palms-up, staring position. Repeat. Benefits: Do this move to work the side part of the deltoid and upper trapezius—the muscle that extends from your neck to your shoulders and mid-back. • Stand tall with your feet hip-width apart, holding two medium weighted dumbbells. Arms should rest in front of your body at arms length, palms facing towards you. • Tilt the dumbbells so that the thumb sides of your hands are higher than the pinky sides, forming a triangle position. • Keeping the dumbbells in this position, raise your elbows until they are nearly parallel to the floor. • Reverse the move and lower the dumbbells to your sides. • Keeping your arms straight, step one foot forward and shrug your shoulders towards your ears as high as possible. • Lower your shoulders and repeat the entire sequence, alternating which leg you step forward with for the shoulder shrug. Benefits: Directly builds and strengthens the side part of your deltoid. • Stand tall with your feet hip-width apart, holding two medium to light dumbbells at your sides, palms facing you. • With a slight bend in your arms, raise your arms directly out to the sides, palms down, until your arms are parallel to the floor. • Pause, slowly reverse the move, and repeat. Benefits: Directly builds and strengthens the back part of the deltoid. • Sit on an exercise bench holding two light dumbbells. • Lean forward about 45 degrees keeping your back flat, allowing the weights to hang down towards the floor to the outside of your feet, palms facing in. • Keeping your torso still, slowly raise the dumbbells directly out to the sides until your arms are parallel to the floor, squeezing your rear deltoids and mid-back at the top of the move. • Slowly reverse the move and repeat. Benefits: This move stresses the back part of the deltoid, which supports good posture, strength and shoulder alignment. • Hold the handles of a resistance band and assume a shoulder width stance, using both feet to stand on the center of the band to secure it. • Exchange handles between your two hands so that the bands cross. • Keeping your torso still, raise the handles as far as possible directly out to your sides, with the back of your hands facing the ceiling. • Lower the handles fully, and repeat. Benefits: This one move allows you to challenge the entire shoulder muscle, including the rotator cuffs, which stabilize the joint and help maintain its health. • Stand tall in a staggered stance, holding two light dumbbells. • Hold the weights up so your upper arms are in line with your shoulders, and your elbows are bent to form a 90 degree angle, palms facing the floor. This is the starting position. • Without lowering your upper arms, rotate your forearms up, creating a goal post position. • Bring your elbows and forearms as close together as possible in front of you. • Return to the goal post position. • Press the dumbbells overhead. • Return to the goal post position, then back to the starting position and repeat. Benefits: By directly building the back part of the deltoid, this moves helps to support good posture and shoulder health, and it improves strength and power in pressing moves. • Holding two light dumbbells at your sides, assume a long, runner’s lunge position, with your stronger leg forward, torso leaning forward, and forming a straight line from your back leg to your head. Keep your back leg straight. • Keeping your torso still and the back of the hands facing up, keep the the back of your hands facing the ceiling as you slowly raise the dumbbells directly out to the sides until they are parallel to the floor, and squeezing your rear deltoids and mid-back at the top of the move. • Lower the dumbbells to the sides of your ankle and repeat. Benefits: This exercise targets both your shoulders and your upper back, helping you build a slimmer, stronger V-shaped torso. • Sit up straight, holding a pair of dumbbells at arm’s length by your sides. This is the starting position. • Keeping your elbows slightly bent and your palms facing down, raise the dumbbells out to your sides until your arms are parallel to the floor. • Lower them back to the starting position, and then hinge forward until your torso forms a 45-degree angle with the floor. • Keeping your back flat, core braced, and a slight bend in your elbows, squeeze your shoulder blades together as you raise the dumbbells out to your sides, stopping when your arms are parallel to the floor. • Lower the weights and return to the starting position. • Continue alternating between the high and low positions with each rep.
Before your jump into any bodybuilding workout, remember that exercise is only half the battle in building great shoulders (or a great body, head to toe). The other half –recovery – happens outside the gym, while you sleep, stretch, and eat. Without the right kinds of protein, carbs, and healthy fats, all your shoulder-building efforts will be for naught.